The game goes on. In order to earn rent on cash, it is necessary to lend on real estate which is easily identifiable and easily evaluated to a wage earning family. Or some version thereof. It is not really that good a system and it produces its own distortions. The worst part of it is that it encourages urban price inflation allowing the lender to lend a lot more money with no real effect of growth. The problem lies directly in governmental regulation. Agents of the current regime have bought into this regime blindly without looking much past their natural self interest. Until they are all enslaved with locked in over priced property, we will see little reform. Canada has developed an even worse scenario in which the housing stock has simply become a proxy for interest rates now in rate extremis. The linkage between bank lending, government guarantees and the like is specific and direct. That is why I want to see those guarantees extended directly to a non urban scenario in which a single dense housing complex is directly linked to provide an internal economy and community of natural size. A sniff of success and the whole urban story will evaporate because all other aspects of urban living are now available in the modern home anywhere except a natural community to provide an internal support system. ive is housing in China? A map called the “HomebuyerMisery Index” made by Chinese netizens, aims to explain. The map has gone viral on the Chinese Internet: it shows how long people in different cities need to save up just for a down payment on housing. Sometimes it’s over ten years—if they don’t spend any income on food and drink. The Misery Index gives a sense of the degree of unaffordability of housing for regular Chinese people, and as such has attracted enormous attention and commentary online. Using income data from the National Bureau of Statistics and house prices from Fangjia.com, a major real estate website, the index looks at how long it takes to save up enough for a 30 percent down payment on an 860 square foot property. Among the 34 capitals and four major cities in Chinese provinces, Hong Kong suffers the most miserable conditions: it takes 19 years of average wages—without spending anything—to save up enough for a down payment. Six major cities on the mainland, all located in east, are ranked “highly miserable,” given that they demand over nine years of savings. Beijing requires 13 years, Xiamen 12, and Shanghai 11 years of income. Per capita income has grown at a much slower rate than the rise in housing prices in China. 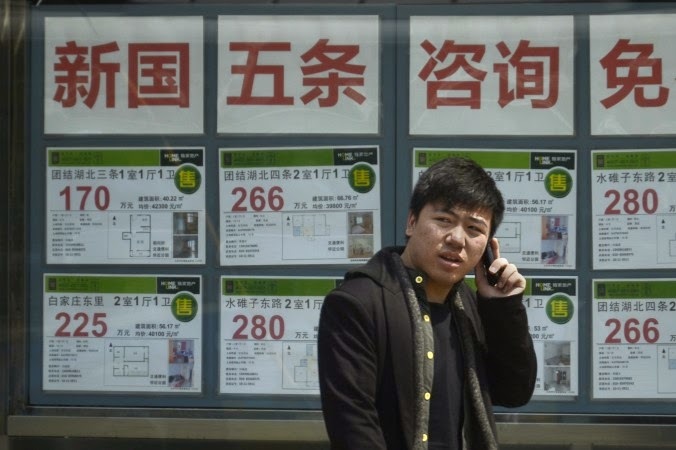 For instance, the average apartment price in Shanghai last month was 30,813 yuan ($4,943) per square meter, $700 more than last April, meaning an 80 square meter apartment would cost an extra $56,000 compared to a year ago. However, per capita disposable income is currently only 4,375 yuan ($701) a month, having increased 9.5 percent over last year, according to the Shanghai Bureau of Statistics. “It takes so long just to pay the down payment, not including money for eating or drinking. Ordinary working-class people probably can’t afford a house during their entire lifetimes,” wrote the netizen “Twentyfourhours” on Weibo, a Twitter-like social media platform. Those who work to pay off mortgages for decades are called “house slaves” in China. It’s common in large cities for two or three generations in a family to pool their money to buy one house for the children—or sometimes huddling to live in one apartment together. The extreme unaffordability of the real estate market may be reaching a turning point this year, however, as the economy slows and price growth becomes increasingly unsustainable. Housing prices have only rocketed upwards since the early 2000s. Double-digit growth rates throughout most of last year dropped to a single digit this year, and the growth rate has only continued to shrink. Data for April indicates it was the lowest growth rate for the last 11 months. Chinese economist Dong Dengxin put it frankly on his blog. “Real estate is the biggest economic crisis for China currently.